Eighteen year old guitarist James Swarbrick is from Bolton, Lancashire. Having recently completed his studies at Chetham’s School of Music, James first started learning guitar with his grandfather at the age of eight. At the age of nine he commenced guitar lessons with local teacher Stephen Lane. In 2008 he performed before the Duchess of Kent and Sir Mark Elder, Music Director of the Hallé Orchestra, as part of the Future Talent programme. Later that year he successfully auditioned for a place at Chetham’s. At Chetham’s he studied the guitar with Wendy Jackson, and also participated in masterclasses with guitarists Craig Ogden, Gary Ryan, Edoardo Catemario, Graham Devine and Mark Ashford. He also studied piano with Jonathan Middleton and the lute with Hugh Cherry. In addition to his work as a soloist, James has also performed as an ensemble musician, having been a member of guitar ensembles of various sizes and the accompanist of singers on both the guitar and lute. He has also worked as a continuo performer on the theorbo in various ensemble performances and in a staging of Purcell’s Dido and Aeneas. 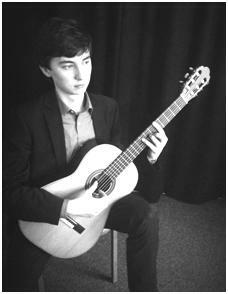 James was highly commended in the UK and Ireland national final of the International Lions Club Classical Guitar Competition 2010, where he was the youngest participant. He was similarly awarded a high mark at the International Competition for Young Guitarists Andrés Segovia in Velbert, Germany. In August 2014, he was awarded both an LRSM diploma with distinction on the guitar and a DipABRSM diploma on piano. In August 2015 he was made a Fellow of the Royal Schools of Music after passing the ABRSM’s highest level performance diploma, in which he presented a programme and dissertation exploring the bodies of guitar repertoire commissioned by Andrés Segovia and Julian Bream in the 20th century. James’s main musical interests lie in the Renaissance period and the 20th century guitar repertoire; these twin interests have led him to be an active member of both the Lute Society and of the Manchester Guitar Circle, where he performs every month. In addition to his musical activities, James also has an interest in literature and politics, and is an avid supporter of his local football club, Bolton Wanderers.